Funeral Flowers online from R& M Flower Company are made by our dedicated and compassionate florist. 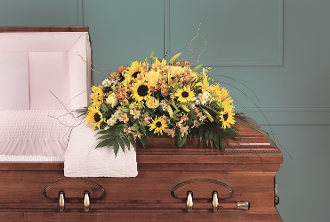 Our florist works with many of the funeral homes in Los Angeles, and we have for the last 18 years. We offer same day funeral flower delivery to funeral homes, personal homes, from out of state to a funeral service in Los Angeles. Even if you can't be there in person, your funeral flower delivery will be a kind reminder that your thoughts are with family and friends. Getting ready for funerals can be stressful and overwhelming for many. We can help ease that for you with our hand designed funeral flower arrangements of different colors and designs. From full tributes, casket sprays, baskets or speciality designs.